current picture of bathroom (second one is looking into hallway. first one is looking out onto backyard and brook/dog offleash park behind my back fence. closer look through back window - wooden fence is my back fence. my chickens behind wire fence. looking into bathroom from hallway. closest bit of wall is a hall cupboard. then drier is sitting in space that i would like to fit washer and drier in bathroom cupboard. to the right of the wall is a bedroom. behind where all the wires can be seen on wall, is a built in bedroom cupboard (1960's style). 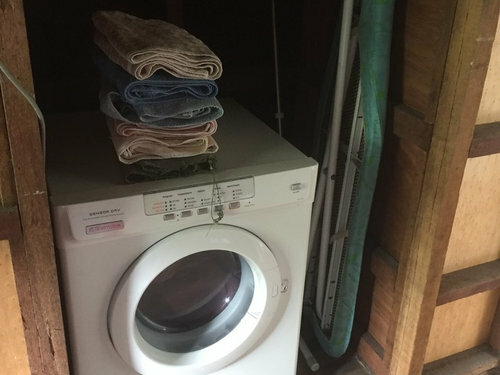 closer view of "laundry cupboard" that will sit in the bathroom and hide my front loader and drier. If the louvred window works out too expensive, then I will just close up the window space and put in a solar skylight..the current window is just too wide...it takes up 1080mm on a 1800mm wall and is timber so not conducive to a wet area. The current window is on south side of house and window can't be any higher because it is already just below the roof cavity as the roof is lower there due to the backsteps being behind the window and roofline sloping down at back of house. 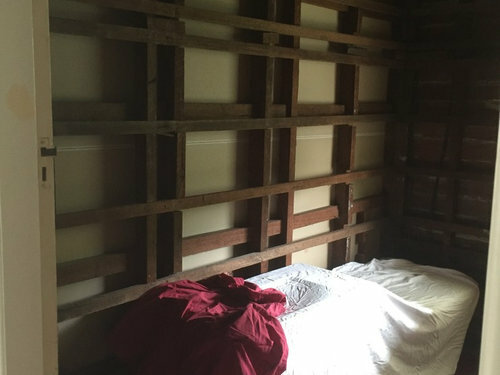 I had hoped for the window to be louvred in order to still let breeze into the house; also to have some outlook to outdoors when the bathroom is not being used for showering! I only want to do wall tiles in the shower area and behind the vanity. Maybe also one tile high around the bottom of wall - not sure. 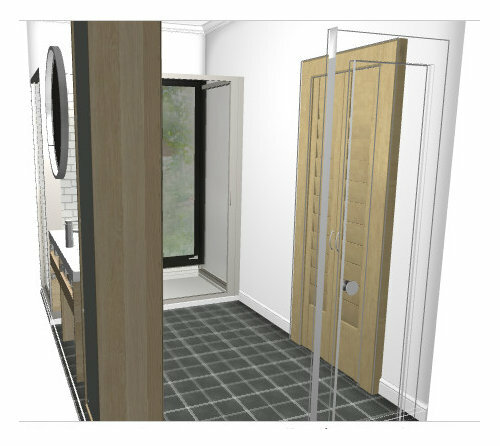 Can someone please provide me with some feedback on this design (oh, I also have pondered whether to change the swing of the door as I can't stand the fact that the door opens onto a cupboard space in the bathroom now) and am not sure whether a cavity door to main bathroom is such a good idea. 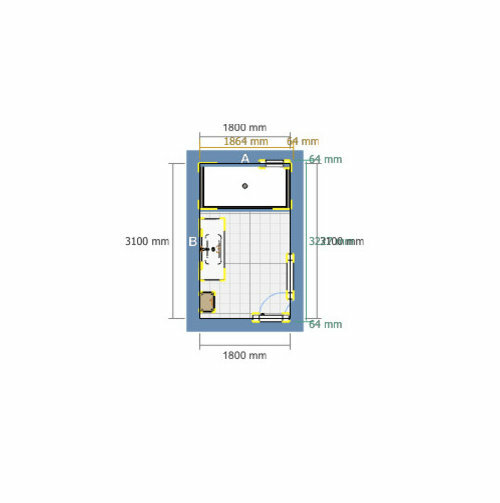 Also would like to consider putting a toilet whether the wall hung linen cupboard is in the drawing (in years to come, if I ever get an ensuite) and don't want a cavity door making this more difficult to do? what tiles and what design to put on floors, in shower area, behind vanity (I also want a nook in the shower for shampoo etc, but couldn't show it on the design). Also, who may sell these in Brisbane. What colour should I do cupboard doors on laundry cupboard (I am hoping for it to be a timber look but not sure what sort). 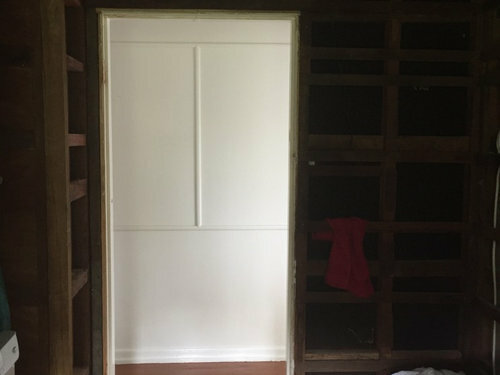 What colour wall hung linen cupboard? What trim should I do on round mirror if any and if a round mirror is even a good idea? Some combo of black, timber and mirrored finish may work for the above, but not sure how to do it. I had pretty much decided to keep the tap fittings chrome as I suspect the black will date too quickly????? (If the louvred window is fitted, I didn't know what trim to do it - black or white). (All other windows in the house are white casement window - very plain and with white 50mm timber look venetians). I LOVE the round mirrors but lack of storage is an issue in my house. 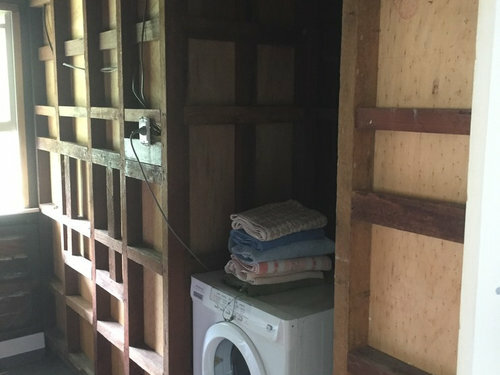 My laundry is currently under the house and I currently am using a garden hose fitted to my laundry tap under the house and several shower curtains and a tarp as my "bathroom" under the house, so I will need to get the bathroom done by winter! 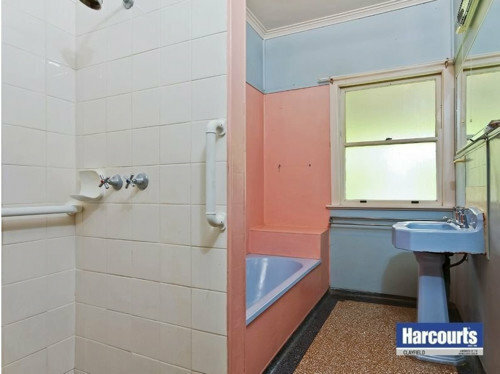 I just have no idea how to combine all the colours I like, and keep the bathroom looking interesting and it not ending up too dark or too much of one thing. Any help from the creative folks out there would be greatly appreciated. (You can see from my idea book 25112016 that I have saved heaps of pictures of ideas). This is so hard doing it by myself and when I am not confident in my ideas as well as not over capitalising on my house. hello. i have looked at your post and i feel that you are a little over whelmed with your project (i don't blame you as honestly bathrooms are a big fat head ache). My advise for design, selling and capitalising is one rule - keep it neat, simple, white or light tones and the best way is with open windows as one of your plans states. Add your pop of colour with towels and accents and honestly do not over think it. Also wood looks beautiful but it is a pest in a bathroom so make sure who ever does it is super good at their job. I live in a new home and my wood kitchen sink ledge is rotting away (should never have been put in). Maximise the great view. Try to have a walk in shower. Use neutrals with perhaps a darker floor as a contrast to lighter walls, pick up colours in towels etc. Stay away from fads. Thanks Lesley. I do like how in the first picture you sent that they have used 3 colours..I was hoping to somehow achieve that...eg. white for most of walls, darker floor and a colour in between that for the feature tile behind vanity ..something like that...just need to find the right tiles. Man, I don't know what to do with that window...it takes up 1.04 (including frame) of a 1.8m wall and does limit the design of the room. The wall to the left of the entry door only as a depth of 85cm and so not really suitable to put a shower in that position. Otherwise, I would have just put the vanity under the window..mmmm...oh, to win the lotto and just have a new house! I agree with a lot of the comments above, you do seem to be letting this overwhelm you a bit. Personally i don't see a problem with the window. I would certainly not take it out as you need natural light and ventilation coming into your bathroom, otherwise it will just be a 'washing cave'. 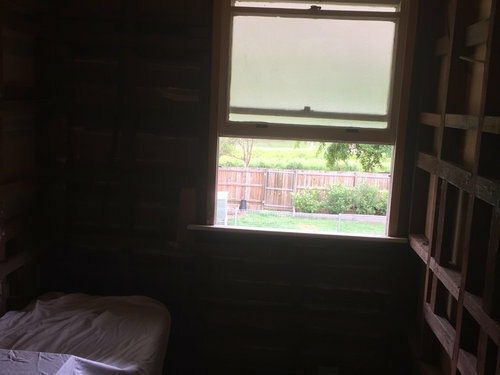 What sort of condition is the window in? Perhaps consider replacing it with an aluminium double glazed window with frosted glass. If you stick to standard sizes (i think 900mm so that it runs to half way, but you could also go for 600mm) then it shouldn't be too expensive. If you run all of the services along the side wall as you have indicated , which is roughly where they are now anyway, then that should keep the costs down too. Do you want a bath or just a shower room? 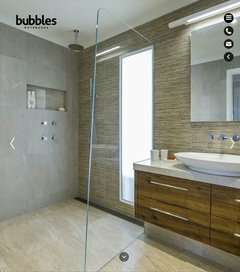 Why put a free standing bath beneath the window with a walk-in shower immediately alongside it? That way the bath can share the shower waste as an overflow and you just need a simple 2.1m high glazed screen for the shower. If you allow 900mm wide for the bath and the same for the shower you will still be left with plenty of room for the vanity and a decent sized mirror. Finally, in terms of keeping costs down, consider tiling just the bath and shower areas and the splash back behind the vanity. You don't have to tile everywhere, especially if you are able to screen off the shower. Thanks Mark. Your opinion is appreciated. The window looks a bit shabby because it is hung casement 50 year old window. I am not going to have a bath, just the shower. I was looking a vertical louvred windows that are about 600mm wide and about 2m high but they are quite expensive. The rest of the house has just timber white casement windows. OK, well it is not ideal to have timber windows right next to the shower. 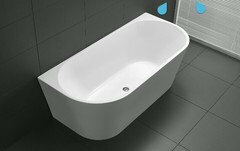 If there was going to be a bath there and it wouldn't be constantly wet then you might have gotten away with a hardwood window. If you get a white aluminium casement window you won't be able to tell the difference. You might find it is quite a big space with just a shower in, you will have roughly 2.2m for the vanity (though it could feel quite luxourious). Personally i would add a bath as it adds a lot to resale value, especially if families are looking at it, but if course it is entirely up to you. Thanks Guys. those sashless sliders are interesting. I have never seen them before. I don't have to worry about the cold because we don't really get a true winter in Brisbane. Girlguides do you have a picture that you could show me of your shower window please. 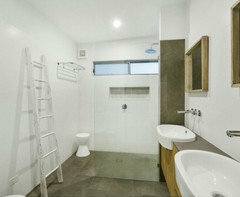 Your mockup scheme is similar to our master bathroom we just completed - photo below. I know you mentioned storage being a concern - our mirrored cabinet has offered an amazing amount of storage in a very small space and also helps bounce light around. I was worried about black taps etc too so we kept chrome fixtures but added in a matte black candle and black potted orchid to create a similar effect which we can change out later on. Our floor tiles are dark but because they are semi-polished they actually bounce around a lot of light and don't make the room feel dark if that is a concern. We also have a huge fiddle leaf fig in the corner (not pictured) which adds a really nice feel to the space - a plant like that could help bring in the outside greenery in your bathroom. Instead of the storage tower you have to the left of the vanity could you do say some floating wood shelving, possibly with baskets added for more hidden storage? You could also bring in the 60s theme with what you displayed on there eg. photos as you mentioned? 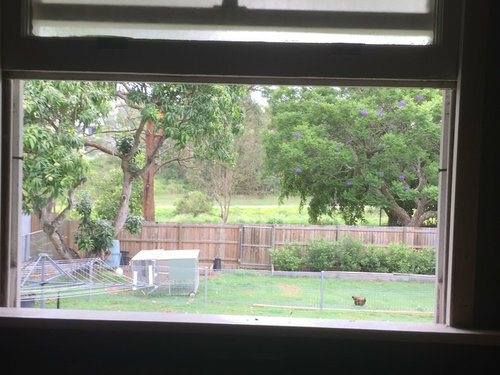 In regards to the window - a previous house we lived in had a window at about shoulder height in the shower - as well as letting in heaps of light it was amazing for storing toiletries etc! Thanks minteddesignco. You came up with some ideas that I hadn't thought about. 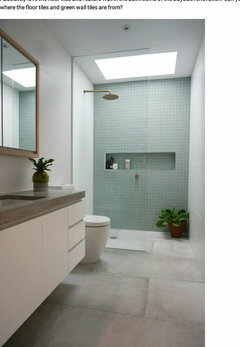 Would you be able to tell me what colour of semi-polished tiles you chose for the floor and where you got them from. Also, the grout that you used for the subway tiles. Are the subway tiles gloss or matt. They appear to be gloss in the photo but just checking. The open shelves and putting 1960's on it and the black candle is a great idea. I am not sure what to do re the window because at this stage I don't know the long term plan for the house and this may be where the house be extended one day...It will either be, go to the expense of putting in the vertical louvred window or just close it up altogether and put in one of those solar light things where you get light in the room whenever there is sunlight...ie. having the light switched on but it powered by solar energy for that one room. (apparently it can be a DYI option). Hi Creativelychallenged. 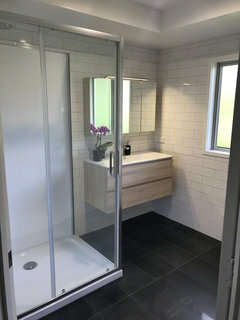 The tiles were from RAK Ceramics - I think you can purchase through these guys in Oz They were Surface Night Semi-Polished for the floors (300x600mm RAK 575) and White Gloss (100x300mm RAK017) Subway Tiles for the walls. Grout - unfortunately I didn't keep a record of what it was! It was our tilers suggestion though and ended up being the perfect colour to feature the tiles without them being too in your face. That window is definitely a tricky one! 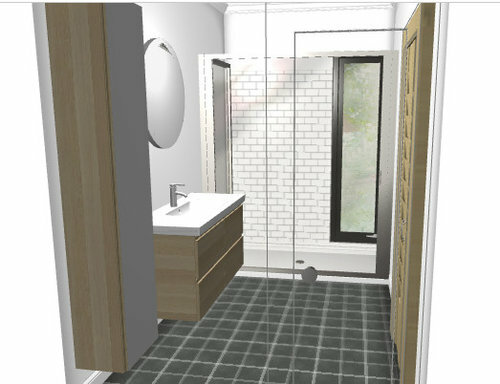 Design advice please on small bathroom reno to queen of UNcreativity!